vCenter Server is the management server for vSphere 5. It is the one-stop shop for managing everything in your virtual infrastructure. It runs on a Windows Server and requires a database for storing critical data. With vSphere 5, the vCenter Server is now a 64-bit application requiring Windows 2008 R2. You do have an option of deploying a vCenter Linux-based appliance as an option, but that appliance is generally considered ideal for smaller environments. As vCenter Server becomes increasingly more important as you start to scale out your Virtual Desktop Infrastructure, it is important to plan for this service to be highly available. The deployment of vCenter Server enables some key features such as vMotion and storage vMotion. vMotion does not require you to move the files associated with the virtual machine, whereas sVMotion does. These files include the configuration, logs, swap, snapshots, and the virtual machine disks, which are commonly referred to as the virtual machine’s home files. Logically, vMotion moves the running state of the VM, but not the associated virtual hard drive, as shown in Figure 2. Figure 2. vMotion copies the running state. VMotion copies the running state of the virtual machine from one ESXi host to another but does not copy the home files. VMotion has a start and a ending to the migration, or copy activity. This is in contrast to VMware FT, which uses the same mechanisms but keeps the copy running continuously to provide a mirrored copy that can be available in the event that the original source becomes unavailable. Storage VMotion can “hot migrate” a running virtual machine between two different ESXi hosts and across different datastores. 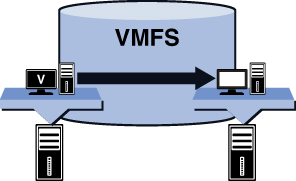 This capability is different from that of vMotion because vMotion enables a virtual machine to hot migrate from one ESXi host to another within the same VMFS, as shown logically in Figure 3. 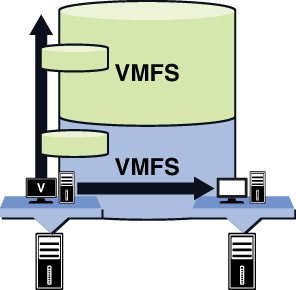 Storage VMotion copies both the running state and the virtual machine’s home files from one VMFS to another. It is important that you understand these fundamental technologies within vSphere 5 so that you can use them to build a better VMware View design. VMotion and sVMotion have enhancements that enable you to automate and take advantage of both. VMotion can be automated through Distributed Resource Scheduler (DRS). DRS allows you to throttle the level of automatic VMotion within a virtual cluster from manual to full automation. In a virtual desktop environment, DRS allows you to level the load across all the hosts so that utilization is evenly distributed. Consider the uneven workload distribution shown in Figure 4. Figure 4. Uneven workload distribution. In this figure, four ESXi virtual servers are running VMware View. Without DRS, however, the virtual desktops are not evenly distributed across the host servers, leading to very uneven utilization of resources across the virtual cluster. One host may be running at 70%–80% utilization, whereas another may be running at 10%–20%. This difference translates to very inconsistent performance across the virtual desktop environment. When you design the vSphere platform with DRS, you get an environment with even distribution. Look at the effect in the logical picture shown in Figure 5. Figure 5. DRS ensures even distribution. sVMotion enables you to do the same with storage utilization. vSphere 5 provides a feature called storage DRS that looks at disk reads and writes or storage input and output and will copy running virtual desktops to the appropriate storage tier by making use of sVMotion. In addition to storage DRS from VMware, your storage vendor might include dynamic tiering capabilities. Dynamic tiering is the capability of the storage system to move in demand data from slower disks to faster disks. Each storage vendor has a slightly different acronym to describe the feature, but in general, you should find out the level of automation, how quickly data is moved, how granular the blocks are in which the data is moved, and whether other storage systems are supported. These technologies are designed to reduce storage hotspots. Storage hotspots are parts of the storage system characterized by high activity, causing long wait times for I/O requests and leading to long waits for data. These hotspots can lead to latency for storage requests that would slow down the performance of your virtual desktops. One of the technical challenges for scaling VDI has been the demand on storage I/O. Storage DRS allows you to take advantage of storage tiering. Storage tiering allows you to put the most needed data on the fastest (most expensive) storage disks and data that is not in demand on the slower (cheaper) storage disks. Storage tiering is key in a virtual desktop environment because of the many types of data used to build out a desktop environment. For example, you have user profile information, Windows OS data, application data, and also different types of end users with different usage patterns. Within one organization, you may have developers who are quite demanding of desktop resources and others who are not. Storage DRS is built on the Storage I/O Controller (SIOC), which monitors for latency at the datastore level. The Storage I/O Controller “controls” access to I/O on the datastore using a series of I/O queues and the number of assigned shares to a virtual machine. If latency is detected, the controller assigns a smaller number of I/O queue slots to virtual machines with a lower number of shares and a higher number of queue slots to virtual machines with a higher number of shares. This assignment is done at a volume level versus a host level so that prioritization is done across all hosts and virtual machines versus within a host and its running virtual machines. Storage DRS has the capability to move running virtual machines to datastores that are experiencing lower or no latency to ensure consistent I/O is provided. From a VDI perspective, this feature allows you to combine faster storage drives (and more expensive) and slower storage drives (and less expensive) and have storage DRS level I/O utilization across the environment. In Figure 6, the environment is made up of multiple tiers with sVMotion and DRS moving Virtual Machine Disks (VMDKs) to ensure a more even distribution of utilization. Host profiles are designed to ensure the configuration of ESXi hosts is consistent across a collection of ESXi hosts or a group of ESXi hosts in a virtual cluster. The availability of this technology in vCenter should influence how you deploy the environment. Perhaps your strategy may be to use host profiles and Auto Deploy and to run your vCenter as a virtual machine. vCenter should be running on a different cluster than the one it is managing to ensure availability if you are considering Auto Deploy. To ensure availability, you should deploy two ESXi servers for redundancy, then deploy the vCenter VM, and finally deploy the remaining physical host servers using Auto Deploy with host profiles in a separate cluster. Auto Deploy allows you to customize the ESXi installable image and then deploy it consistently across all ESXi hosts. It is important that you configure your design and architecture and understand what features you will use and why. It is also important to consider a method of deployment that reduces the time and complexity it takes to get things up and running. Depending on how big the environment is, getting things running could take a considerable amount of time and effort.